For a more immersive gaming experience, try putting a sensor in your shoe. That’s the idea behind Boogio, a system that can turn any shoe into a smart shoe by using sensors to capture body movements. Target markets include gaming and a diagnostic system that can help people improve how they run and walk. In this video, we’ll take a look at Seattle-based Reflx Labs, which is targeting gaming with its Boogio sensors. 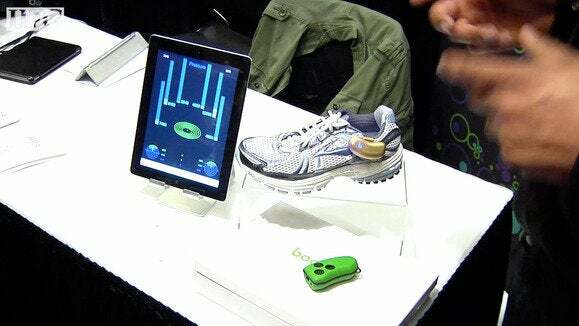 A sensor from Reflx Labs attached to a shoe can detect body movements. That data can be used to show how a foot moves across a 3D space. “Entertainment is about games and using it as a controller so that your body now becomes immersed in a game. You become the controller,” says Jose Torres, Reflx Labs’s co-founder and CEO. Boogio is launching a software development kit this summer and plans to release a consumer product in 2015.